The most important factor in improved student learning is an effective teacher. Written ten times a year, Harry and Rosemary Wong's columns feature effective teachers and administrators and their techniques for enhancing student learning. An archive of past articles can be found at the end of every column. Harry and Rosemary Wong are happy to share with the profession the strategies and techniques of effective teachers. If you have an effective technique that works, please share this by sending it to hwong@harrywong.com. The Wongs will consider it for sharing in future Effective Teaching columns. Harry Wong has been awarded the Outstanding Secondary Teacher Award, the Science Teacher Achievement Recognition Award, the Outstanding Biology Teacher Award, and the Valley Forge Teacher's Medal. He was selected as one of the most admired people in the world of education by readers of Instructor magazine. Rosemary was chosen as one of California's first mentor teachers and has been awarded the Silicon Valley Distinguished Woman of the Year Award. Nearly a million teachers worldwide have heard his message. Because he is fully booked for two years, he has agreed to and has invited his wife to join him in doing a monthly column for teachers.net so that more people can hear their message. Harry and Rosemary Wong are committed to bringing quality and dignity to the materials they produce. For this, they have formed their own publishing company, of which Rosemary is the CEO. They have dedicated their lives to leaving a legacy in education and making a difference in the lives of teachers and students. Their latest contribution to helping teachers succeed is an eLearning course, Classroom Management with Harry and Rosemary Wong. The course can be taken in private at the learner's convenience. The outcome of the course is a 2 inch binder with a personalized Classroom Management Action Plan. This Action Plan is similar to the organized and structured plan used by all successful teachers. Details for the classroom management course can be seen at www.ClassroomManagement.com. The Wongs have written The First Days of School, the best-selling book ever in education. Over 3 million copies have been sold. The third edition of The First Days of School includes an added bonus, an Enhanced CD featuring Harry Wong. The Enhanced CD, Never Cease to Learn, is dedicated to those teachers who know that the more they learn, the more effective they become. You can hear Harry Wong LIVE on a set of CDs,, called How to Improve Student Achievement, recorded at one of his many presentations. He is the most sought after speaker in education and his presentations are legendary. When the book, video series, CD, and eLearning course are used together, they form the most effective staff training tool for developing effective teachers. Staff developers and administrators who would like to know how to implement the aforementioned book, video series, and CD are encouraged to consult the book, New Teacher Induction: How to Train, Support, and Retain New Teachers. Information about these products can be found by visiting the publisher's website at www.EffectiveTeaching.com or www.HarryWong.com. The research is very specific: Well trained, proficient and effective teachers produce student learning. Administrators—Why do you keep doing this? Each year schools spend $7.3 billion recruiting and hiring the same new teachers to replace the same teachers hired the year before. They are given a mentor, yet the attrition rate stays the same and student learning does not improve. When the next new teacher is hired, he or she is given a mentor, too. No one ever stops and analyzes why the pattern keeps repeating itself. One-on-one mentoring does not improve student learning. Click here to see the research. New Teachers—Why do you keep doing this? You’ve invested tens of thousands of dollars preparing to be a teacher with the intent of making a difference in the lives of young people. You are eager, dedicated, intelligent, compassionate, and want to teach. And yet, you don’t know anything about the district that is hiring you. In which district would you like to work? District 1: You are given your assignment and told to go and teach—on your own. You may be given a mentor, a veteran teacher down the hall, who may be of help, if asked. Or, the mentor may be a full time mentor who has been given a case load of 14 teachers and the mentor comes around once a week or every other week to see you for an hour. District 2: You are given a mentor, several coaches, lead teachers, administrators, and a host of activities all designed to fulfill the potential in you. This is what you get in the Hopewell City Schools. And if you have been hired at Carter G. Woodson School in Hopewell, Virginia, the new teachers are given a SHOWER. The teachers celebrate your arrival by putting out boxes and baskets where the other teachers can place materials for bulletin boards, sticky-notes, crayons, books, and necessities of the classroom. Then, the staff helps you, the new teacher, set up your classroom! The Hopewell City Schools is a highly distinguished Title 1 school system and a Standard and Poor’s Outstanding School Division. Hopewell has had a large turnover in the last three years due to retirement and licensure issues. Thus, the induction program takes on greater importance. The reason Hopewell succeeds with its new teachers and its students is because they have a comprehensive new teacher induction program. To see a brochure summarizing the Hopewell New Teacher Induction program, click here. Common sense would tell you that in every aspect of life, people are given a full complement of activities and people to train and support them from the day they come on the job until the day they leave. Comprehensive training programs are the norm for most jobs. Ask the fire chief, the store manager, or hospital executive what they do with new employees. Ask the baseball manager, construction foreman, or senior partner in a law firm what they do. Ask the workforce at Domino’s Pizza, Starbucks, The Cheesecake Factory, and McDonalds. They all will tell you that every employee is trained. And in most cases, the training continues until the employee leaves the company. Even the best educated of new employees need on-the-job training. Despite completing college and medical school, doctors spend years working as hospital residents before entering private practice. Newly elected judges, armed with law degrees and years of experience, attend judicial college before assuming the bench. Pilots receive initial training and recurrent training every time they change positions, such as from co-pilot to pilot, and when they fly a different type of plane, such as from a 737 to a 757. In the Hopewell City Schools, new teachers are given a full complement of activities and skilled people to help them become proficient and effective. Buddy: This is an assigned teacher to serve as a buddy to whom the novice teacher can turn for immediate, simple help, such as answers to school procedural questions or quick advice. Hopewell correctly designates this teacher a buddy and not a mentor. Makes the new teacher feel welcome. Helps the new teacher find the essentials. Provides information on routines, procedures, and the unwritten roles. Provides a sounding board and some nonjudgmental advice. Coach: This is a teacher with expertise in classroom management and instructional skills. There are presently at least four in each school and their role is to coach, as their title implies, for skill in classroom management and instruction. Provides instruction in skills for effective teaching. Provides instruction in classroom management. Assists in procedures and routines. Assists in planning instruction and refining organizational skills. Develops intervention plans for struggling students. Collaborates with teachers in grade level and vertical team meetings. Demonstrates best practices in instruction and classroom management. Meets with the principal and goes over assessments, progress, and suggestions for improvement. Lead teacher: This is a teacher who can help with subject matter questions. There are five on each campus, each specializing in one of five areas—English, math, science, social studies, and technology. The lead teachers coach for desired results. Is knowledgeable in the state Standards of Learning (SOL). Has expertise in SOL test data interpretation. Understands the connections within and across disciplines to support student achievement. Identifies the best practices in instruction. Reviews scope and sequence of curriculum. Reviews Standards of Learning Blueprints and Curriculum Framework. All of the coaches and lead teachers receive training, teach in the same building, and receive release time to observe and assist. Coaches and lead teachers are financially compensated for attending conferences. They then do follow-up training on what they have learned. Administrative Support and Monitoring: In addition, the new teachers receive assistance from staff developers and administrators from both the central office and the building site. Are the instructional leaders for the school. Supervise instruction in their building. Are pivotal in ensuring that all teachers are effective at helping their students learn. Are responsible for evaluating teachers. The principals realize the clinical supervision model for all teachers is an excellent tool to teach, not to rate. Thus, the new teachers are taught to analyze and reflect on their own lessons. The assistant superintendent, Linda Hyslop, structures and coordinates the new teacher induction process and keeps a vision for the program. Upon signing their contract, new teachers are given a copy of our book, The First Days of School, and Robert Marzano’s books, Classroom Instruction That Works and Classroom Management That Works. Four days of orientation and workshops before all staff return. The first day includes time on core curriculum, special education, Standards of Learning (SOL) for Virginia Public Schools that describe the commonwealth's expectations for student learning and achievement in grades K-12. The second day is devoted to Skills for Effective Teaching (SET), the Madeline Hunter Model. The third and fourth days focus on technology training. A field trip during orientation takes the teachers around the community and ends at a historical home where the Historic Hopewell Foundation welcomes them. A "welcome" breakfast is hosted by the Chamber of Commerce. Three years of ongoing, structured training and support is provided by the SET coaches. Selected events from the Pathwise Induction Program, formerly distributed by the Educational Testing Service, are conducted. These activities are used with teachers having no experience to augment the SET program. Observations and feedback by SET coaches are provided all new teachers. Opportunities to visit demonstration classrooms of master teachers over a three year period are arranged. A “get together” luncheon is held for the new teachers and their buddies. Support of lead teachers in core content areas and special education is provided. Observation of modeling instructional strategies by lead teachers is arranged. Collaborative planning and sharing of resources with grade level, team and/or department is conducted. Observations and feedback is conducted by Core Curriculum Supervisors. Provisions for networking among new teachers are arranged. A Celebration is held at the end of the school year to recognize the new teachers and their supporters. All of this support is given to a new teacher upon joining the Hopewell schools. Can you understand why all the schools in Hopewell are 100 percent accredited? Let’s return to the question posed at the start of this column, in which school district would you like to work—District 1 or District 2? If you picked District 1 (a district offering no help or just a mentor) because you believe you can succeed on your own, then consider the data on new teacher attrition. Since the one component is most typically a mentor, it will barely help in reducing new teacher attrition, from 41 percent to 39 percent. If you choose District 2 (the Hopewell City Schools) your chance of dropping out of teaching drops to 18 percent. That is, four out of five teachers will still be teaching. 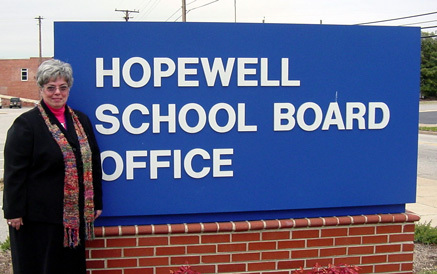 Hopewell does not attract and keep new teachers with money. They train new teachers to succeed. Teachers who succeed do not leave a school district or the profession. Districts that want you to succeed have an induction program designed to help you succeed. Before you agree to work for a district, ask some key questions. These can be found in a previous column, “Applying for a Job in a Tight Market, Part 1.” Click here. The Association for Supervision and Curriculum Development (www.ascd.org) in its Education Topics defines “mentoring” based on a book by McBrien and Brandt, The Language of Learning. Today the best districts coach, not mentor, their new teachers and place them in learning teams to develop their teachers to state specified proficiencies. Mentors are important in providing emotional support and answering basic questions for survival. That is their role, whereas coaches have responsibilities. The major responsibility of a coach is to help maximize personal and professional potential, while concomitantly upgrading their own professional proficiency. Mentors are under no obligation to upgrade their role as a mentor. Hopewell financially compensates their coaches and lead teachers for attending conferences and upgrading their own proficiencies. Coaching is customized and focused on providing instruction on what needs to be accomplished. Coaches tailor support, assess each teacher’s progress with observations, use interviews and surveys, and have follow-up visits. Teachers feel more motivated and responsible to act on new skills learned because coaching is personalized, customized, and ongoing. Just as a tennis coach, a fitness coach, or an executive coach has a responsibility, educational coaches have similar responsibilities of producing proficiency too. Schools often have coaches for literacy, math, science, and technology. Coaches have a ‘big-picture plan’ for student achievement. To accomplish this they suggest or show teachers what to do and assess for progress. Tom Guskey, an expert in evaluation design, analysis, and educational reform, found that coaches focus on student learning goals, identify small measurable steps to tailor goal accomplishment, and plan professional development that differentiates for each teacher based on their needs. The emphasis is on student learning and coaches coach for learning. To read more about the responsibility of improving student learning, click here to read “Improving Student Achievement Is Simple, Part 1” and click here to read “Part 2” of the same article. In many districts, the mentors have taken on some coaching responsibility for teacher proficiency. Proficiency is essential if there is to be a concomitant improvement in student learning because the research is very specific. It is the teacher. The more proficient the teacher, the more the students will learn. Retaining teachers is not the same as helping teachers become proficient and effective. Retaining teachers is another component of a comprehensive induction program. Once districts invest in coaching teachers to improve student achievement, they must continue this training over the tenure of a teacher’s professional career. Supporting teachers in a variety of ways is crucial to longevity in the profession. No two induction programs are identical. Just as every business trains their own employees to their own set of goals, successful school districts each have their own unique induction programs. Here are links to school districts and the structure of their induction programs. Click on each name to be directed to an overview of each district’s induction program. If you are a pre-service teacher looking to be hired this fall, you know the support you’re looking for in a school district. Coaches! If you are an administrator dealing with low test scores and fleeing teachers, you know the kind of support you need to establish in your school district. Coaches! If you are a teacher in a non-supportive school district and want to move, you know what to look for in a caring school district. Coaches! Answering the question “In which district would you like to work?” is a no brainer. Districts that support and grow you will always score big both in student achievement and teacher satisfaction. That’s the victory the school boards, administrators, parents, teacher, and children what to achieve. It can be done as a community of professionals working and planning together. We’ve shared with you the structure for success through the years. It’s time for you to execute a winning game plan.